The sleeping zone is the ultimate place meant to relax. The room where we spend, on average, a third of our life. That's the reason why it has to result beautiful, warm and welcoming, reflecting in style and personality its surroundings. Besides, it has to be functional, efficient and provided with every small kind of comfort. As the bad system remains the strong and essential point, anchor of the whole area, choosing how to furnish the sleeping zone extends to all the other complements, furniture, fabrics and objects of the room, in order to make it more intimate, enjoyable and functional, improving its quality and comfort. The line HOTELLERIE develops a new concept of room, bound to the contract's world but open to all the other environments, in an absolutely original way. Precious fabrics, combinations full of style and enveloping forms highlight spaces and settings with a total look that follows the unmistakable mark of Softhouse collections. 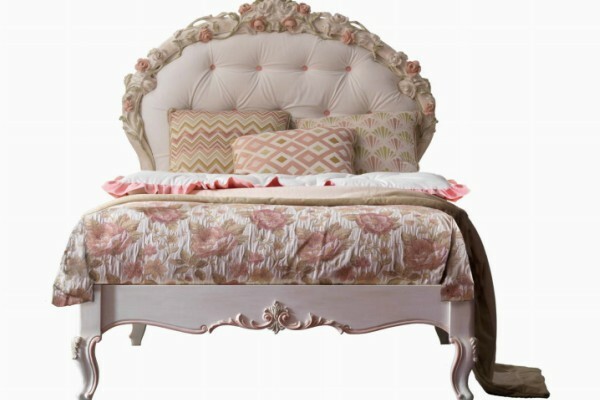 Bed OCEANO. Impressing and versatile, this new bed is the absolute protagonist. The bed Oceano has a double headboard made of leather and pure linen. A sparkling contrast between the classic style of grey and the precious tones of brass. Fabrics with lissom lines, that switch between plain colours anretro patterns. The tones go from cool blue to warm coral and vibrant yellow. Details and combinations are totally customizable. A contemporary style with a touch of glamour. Bedroom Luigi XVI Wardrobe ARU01 with lacquered bleached gold finish Night table CO01/L/62 80 Bed Headboard Luigi XVI TES01/VOCAP/L183 Customizable on demand and strictly handcrafts. Elegant, sophisticated, comfortable! The new sleeping area New Feeling by Brummel presents an sumptuous totally upholstered and leather padded bed with leather headboard, with pull out bedside tables and compartments. Very fashionable platinum lacquered finish and Led side lighting. The bed is enhanced by impressive portal, composed by smooth frame 15 cm featuring exclusive Rock Wood finish with black velvet backdrop and integrated with handmade crystal and Led lighting, all perfectly completes the sleeping area. Premium Top Comfort is a revolutionary, top-quality mattress conceived to give the utmost sleeping comfort. The exclusive materials work actively, in an integrated manner to control the body temperature and mantein it ideal for regenerative and physiological processes throughout sleep. Premium works to leave you feeling good, it boosts cell regeneration and prevents the action of free radicals that cause ageing. And by boosting circulation, it also has an efficient preventive effect on cardiovascular problems.